Major Pamela Miller is the Court Division Commander at the DeKalb County Sheriff’s Office. The division is responsible for maintaining a safe and secure environment for all those that work in and visit the DeKalb County Judicial Complexes. 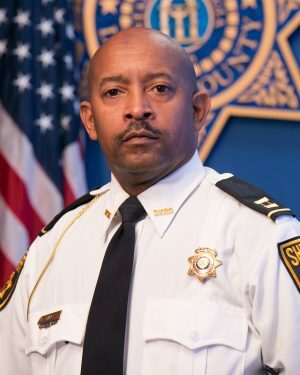 Those facilities include the DeKalb County Courthouse in Decatur and the Memorial Drive Complex – location of State Court Traffic, Magistrate Court and Juvenile Court. 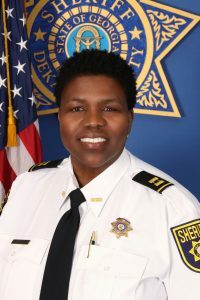 Major Pamela Miller began her career in law enforcement in 1992 when she joined the DeKalb County Sheriff’s Office as a Detention Officer following graduation from Georgia State University with a Bachelor of Science degree in Criminal Justice. In 1994, Major Miller was promoted to Deputy Sheriff and assigned to the Field Division. Major Miller continued to receive promotions and assignments throughout the Agency. As Deputy Sheriff Sergeant, she supervised the Grady Transport Unit; as Deputy Sheriff Lieutenant in the Jail Division heading Inmate Services. After being promoted to Deputy Sheriff Captain in 2006, she worked as Jail Watch Commander, Field Uniform Division Assistant Watch Commander then Court Division Assistant Watch Commander. As Deputy Sheriff Captain during 2015, she served as Interim Court Division Commander. In 2016, she was promoted to Major and assigned to the position of Court Division Commander. A native of Columbus, Georgia who was raised in Augusta, Georgia, Major Miller received her Master of Public Administration from Columbus State University Command College in 2010. She is a member of the National Organization of Black Law Enforcement Executives (NOBLE), a Certified Verbal Judo Instructor, and a P.O.S.T. Certified Instructor. 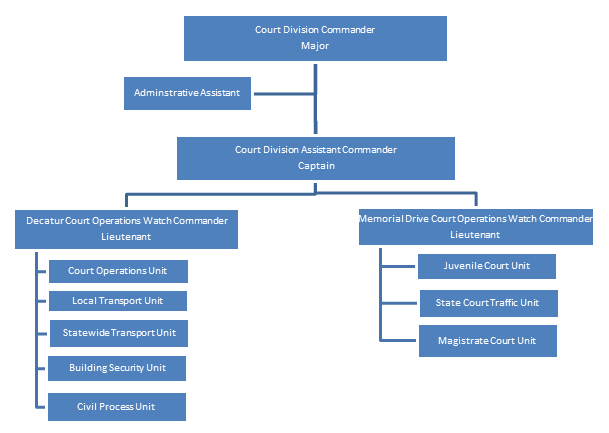 The Court Services Division is responsible for the security of all the county’s courts and individuals within the premises.